More Patients, Not Fewer, Turn To Health Clinics After Obamacare : Shots - Health News Patients are flocking to community health clinics for care. Obamacare advertising brought a lot of people out of the woodwork who wanted health insurance but didn't qualify for it. 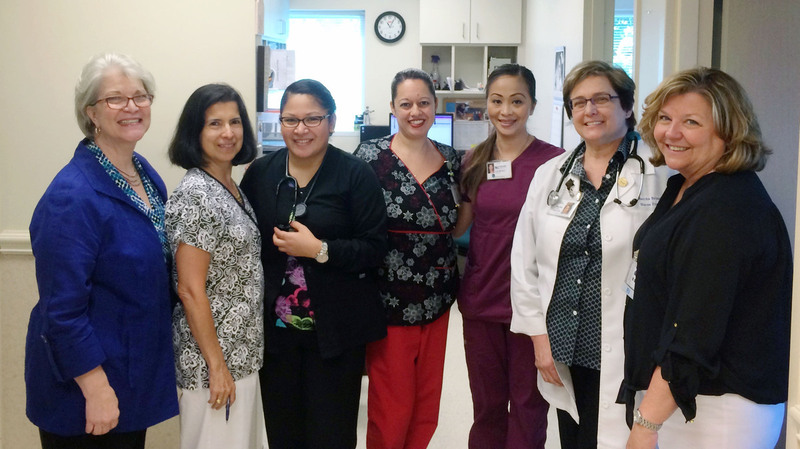 The staff at the Charlotte Community Health Clinic: Nancy Hudson (left), Maria Elena Solanilla, Tonya Luna, Lisa Ortiz-Fraticelli, Charm May Agustin, Martha Brinsko and Tamara Withers-Thompson. Diabetes is something nurse practitioner Martha Brinsko helps a lot of patients manage at the Charlotte Community Health Clinic in North Carolina. "Most mornings when you check your sugar, what would you say kind of the average is?" Brinsko asks Diana Coble. Coble hesitates before explaining she ran out of what she needs to check it, and she didn't have the gas money to get back here sooner. Brinsko says Coble can get what she needs at the clinic. "If you need to get more than one box, get more than one box," Brinsko says. "But you need to check them every morning so that we can adjust things." Coble is unemployed, lives with her sister, and relies on the clinic for health care. "They do a great job with everything," Coble says. "I couldn't do without them." Nancy Hudson was the clinic's director as Obamacare rolled out, and now consults for the clinic. She says she expected the insurance exchange, or marketplace, established under the Affordable Care Act would reduce the number of patients like Coble. The opposite happened, she says. "What we found within our patient population and within the community is that a lot of the advertisement and information about the marketplace brought people that didn't know anything about free clinics and did not qualify for any of the programs within the ACA marketplace," Hudson says. And now they get care at the clinic. Obamacare was designed to cover the poorest people through Medicaid expansion, but the Supreme Court made that optional. The result in some states is a gap, where some people, like Coble, make too much money to qualify for Medicaid but not enough to qualify for insurance subsidies. "Over half of the people that we see would've been eligible for Medicaid expansion had the state elected to exercise that option," says Ben Money, president of the association that represents North Carolina's community health centers. North Carolina is among the 21 states currently saying no to Medicaid expansion. Many are in the South. Louisiana is another example. Dr. Gary Wiltz, the CEO of 10 community health centers in the southwestern part of the state, says demand has surged. "We've gone from 10,000 patients to 20,000 in the last six or seven years, so we've doubled," he says. Wiltz says other things are at play. The economic recovery hasn't reached many of the poorest people, and some who qualify for Obamacare subsidies say their options are still too expensive. "The need keeps increasing, and I think that's reflected throughout all the states," he says. The Charlotte clinic's Nancy Hudson says there's another part of the Affordable Care Act helping fuel the growth: additional funding for community health centers. Hudson found out last week that the clinic is getting about $700,000 to expand in partnership with Goodwill. "Many of their clients did not have any access to health care," she says. "They can't train and sustain a job if they don't have the basic needs taken care of, and health care is one of them." This story is part of a reporting partnership with NPR, WFAE and Kaiser Health News.